Effect of swift heavy ions (SHI) on low-k SiO2 thin films has been investigated. SiO2 thin films were deposited on pre-cleaned p-Si substrate by using sol-gel spin coating technique. Further, deposited films were annealed at 400 ∘C to remove structural irregularities. Prepared samples were irradiated with 200 MeV Ag15+ ions at different ion fluence such as 5 × 1011, 1 × 1012 and 5 × 1012 ions/cm2. Deposition of SiO2 was confirmed by using EDAX and FTIR spectroscopy. Increase in ion fluence increases the RMS roughness from 1.49 to 7.79 nm. The transformation of deposited material from polycrystalline to amorphous nature was confirmed from XRD spectra. Increase in SHI fluence decreases the grain size from 181.3 to 74.1 nm for pristine and sample irradiated at 5 × 1011 ions/cm2. Whereas, for sample irradiated with 5 × 1011 ions/cm2 fluence doesn’t show crystalline peak at (011). It is observed that SHI irradiation leads to grain agglomeration with decrease in crystal size at higher fluence. Further, conductivity of the samples under study was observed to be decreased with increase in ion fluence. 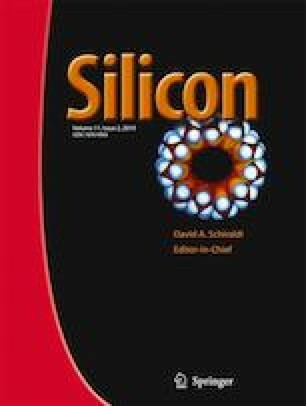 Thus, it is demonstrated that the surface and structural properties of low-k silica thin films can be tailored by controlling the SHI fluence. Authors are thankful to SERB, DST, New Delhi for providing financial assistance for carrying present research work (Letter No. SR/S3/EECE/0131/2011 dated 29th August 2012) and also grateful to Inter University Accelerator Center (IUAC), New Delhi, India for providing the irradiation and characterization facilities. Anil S. Gaikwad is thankful to UGC, New Delhi for providing financial assistance in the form of BSR Fellowship.